Villa Vedici offers Kite surfing lessons since 2009, and is the only IKO (International Kiteboarding Organization) licensed place in Cambodia. Villa Vedici uses the newest equipment available on the kiteboarding market. Vedici has earned an excellent reputation for kite courses in Cambodia. As we are sure that our students will be pleased with our kite lessons, we offer a unique experience! From beginners to experts, we welcome everybody to join and have a great time. 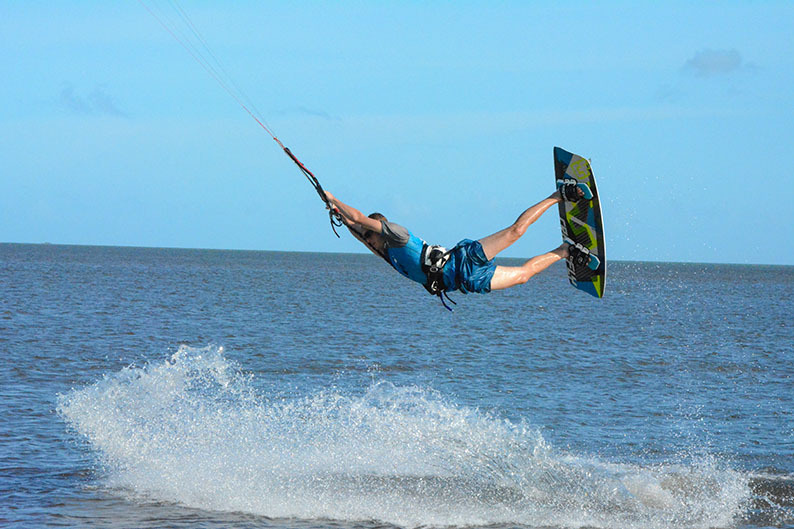 Kampot has a great beach to kiteboard. About 10 minutes by car or speedboat from Villa Vedici is a nice sandy beach to set up your kite. The water is warm and shallow which makes it a perfect kite spot. Also you wouldn’t have to compete with fellow kiters for a good position as it is spacious and quite. You basically are on a private beach with only you and your kite. Wind conditions in Kampot are regularly very good. Especially from May till November, the wind season is at its best. But as for any other part of the world, one can never give guarantees. Before going, it is useful to check windfinder.com and search on Phu Quoc. Though it shows not to be very reliable, it gives you an idea of the wind expectations. Villa Vedici offers various courses in kite surfing. Most likely one of these courses will be able to satisfy your desires. For those that are still in doubt about kiting, a taster course can be quite useful. It gives you the basics of kiteboarding in two hours. After this run, you know what kite surfing is about and whether or not it has triggered you into continuing following lessons. The two day beginner course is recommended for those who want to give kite surfing a real chance. After two days you most likely will be able to get on the board and cruise around the sea. This course will give you the most fun and let you learn a lot about the kiteboarding sport. The first day you learn the skills described in the taster course plus additional safety skills. The second day it is all about getting on the board and surf. – Edging and riding upwind. After the two day beginner course you will be at a stage where you will have learnt all the nuts and bolts of kiteboarding. You will be registered as an official IKO member. From here on, it is just a case of getting out there and practicing more; either by having more lessons or hiring/buying a kite yourself. Are you an experienced kiter and travelling around without brining your own kite? We rent complete kiteboarding gear. It is recommended for those taking courses or renting kites to insure yourself with a $US 10 damage insurance. This will prevent you from costs in case of damage to the kite. We provide pick-up service in and around Kampot for those interested in kiting. However, it is more convenient to stay in Villa Vedici and combine your overnight stay in our guesthouse with a kite surfing experience. Please do not hesitate and contact us as soon as possible! Villa Vedici is an official Ozone dealer. Our kite store offers excellent deals on brand new, just released quality kitesurfing materials. From the latest kites, to harnesses and quality clothes, everything you need as a passionate kiter is there for you. Besides brand new stuff, we also have used kites for sale. Ask us to show them and get yourself a great deal.